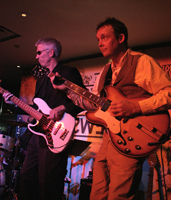 The Bluescasters were formed in 2004 in Ann Arbor, Michigan by Harry Rodman (drums and vocals), Kerry Adams (guitar), and Doug Wolgat (bass and vocals). 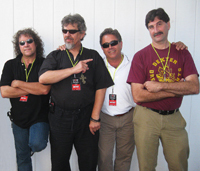 Since adding the fourth band member in 2005, Phil Ryski (harp, keyboard, piano and vocals), the band has released three albums. 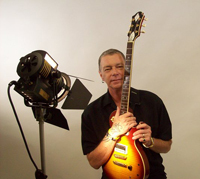 In October of 2009, the Bluescasters welcomed Ann Arbor guitar wizard Brian Delaney into the band, replacing founding member Kerry Adams. The band plays a mixture of groove oriented and up-tempo blues originals as well as local favorites. Corndaddy’s music harkens back to the glory days of country rock through filters of power pop, bluegrass and British invasion pop/rock. 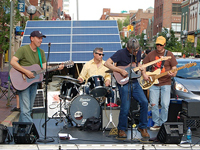 The group, composed of Jud Branam on vocals, guitar and banjo; Kevin Brown on guitar, vocals, harmonica and mandolin; Will Stewart on drums, guitar and vocals; and Jerry Hancock on bass, has been nominated for three Detroit Music Awards in categories of best CD, instrumental performance and best songwriting, and they were featured in the national magazine Performing Songwriter. The Global Jazz Project, previously the Global Jazz Trio, has performed and recorded together for the last 10 years. 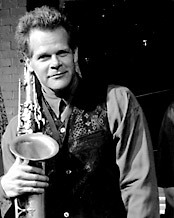 Mark Hershberger, the group leader, has been performing and composing jazz for over 40 years and has been fortunate to perform, learn and play with great musicians such as Dizzy Gillespie, Jimmy Allen, Marcus Belgrave, Doc Holiday and Ed Sarath, just to name a few. Guitarist and mandolin player Michael Colone, Saxophonist Mark Hershberger, bassist Richard Smith and percussionist Muruga Booker create global jazz spanning traditional, ethnic and world jazz. Presenting a program entitled “Songs That Made a Nation: The Making of America, 1840‑1880,” the Dodworth Saxhorn Band performs in 19th century attire on historic instruments. This program is a participatory musical and educational concert, including such songs as My Darling Clementine, Amazing Grace, Yankee Doodle, I Ride an Old Paint, Gary Owen and Washington Greys March. During its 25 year history, Dodworth has presented concerts in venues ranging from small communities to the White House, in Washington, DC. Performing choice selections from the American Songbook of jazz, the Paul VornHagen Quartet, with their celebrated interpretations and musical arrangements, is in a class all their own. Band leader Paul VornHagen is a five-time winner of the Detroit Music Awards on sax, flute and vocals, Phil Kelly is known for his mastery of the keyboard and fast-fingered improvisations, Kurt Krahnke is one of the area’s most well respected and well loved jazz bassists, and drummer Sean Dobbins’ exuberant personality jumps right out through his music. This talent packed quartet really delivers. Creole du Nord’s sound can be traced to southwest Louisiana’s traditional music mixed with some crossover tunes such as “Cluck Old Hen,” “Rueben’s Train” or some forgotten gospel song of the “Okay” label. When they say they play Creole and other traditional music, what they’re really talking about is some down home sawing or two-steppin’ on a sawdust floor. So come hear the band, move a little and have some fun. 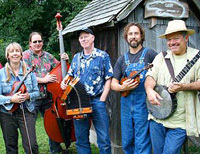 Chuck Anderson plays acoustic & electric bass, Beate Williams plays the banjo-uke & scrub board, Mark Palms plays accordion & fiddle, Mike Zivsak plays fiddle & guitar, and Randy Markey plays guitar & banjo. Since 1993, this lively and accomplished quintet has entertained audiences throughout the Great Lakes region with excellent vocals and high-energy arrangements of new and old jazz standards, soulful ballads and unique instrumentals. All of the band members are impressively versatile. Eric Nyhuis on drums, Myron Grant on guitar, harmonica & vocals, Jake Reichbart on guitar & vocals, Paul Keller on bass, and Paul Winder on fiddle, all have a full-bodied and eclectic sound as well as decades of performing experience. You’ll hear swing, Texas swing, free-wheeling be-bop, comic storytelling songs and much more. 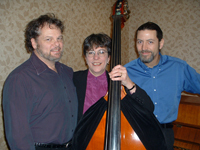 This vocal, bass and piano trio performs sophisticated versions of the most well-loved American jazz standards. Familiar tunes by Cole Porter, Harold Arhlen, Gershwin and Frank Sinatra are given new charm and style as led by Maggie Waltz on bass. With her vast background and musical backbone, the rest of the trio can be free with the melody, rhythms and solos. Outstanding vocalist Kyle Newmeyer and keyboardist and U-M School of Music graduate David Perample don’t miss this chance to shine alongside Maggie.